I decided while baby Arya was napping-that is if she cooperates, lol I would try and sneak in my craft room. Yeah, she took a 2 hr nap! She is teething and she just got her 6mo shots so....wasn't sure how she'd do today. I have a blogger friend who I am constantly inspired by and I found a challenge that I thought would be fun to play in. 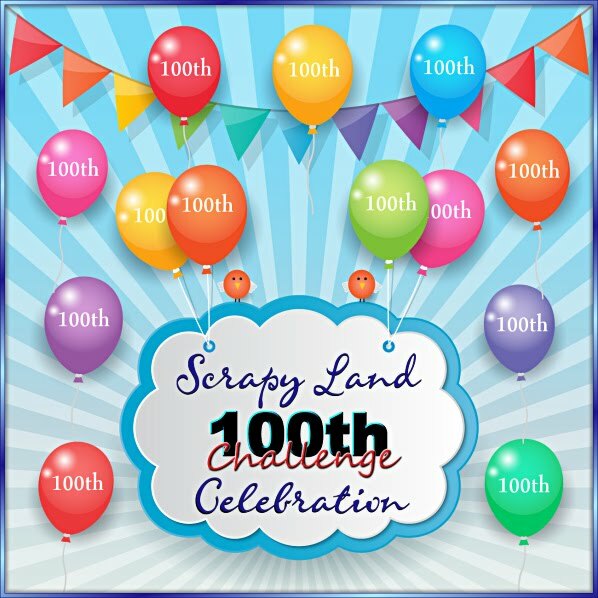 The challenge is at Krafty Girls and the challenge is to create a paper craft that is "scrap lifted" from someone who inspires you.....So, with that being said, I have scrap lifted an idea from my friend, Lisa over at A Mermaids Crafts. 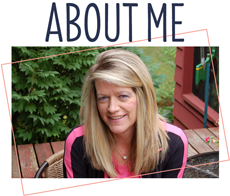 Her projects are always so fabulous and inspiring and if you haven't seen her work...you must check it out! She is amazing! 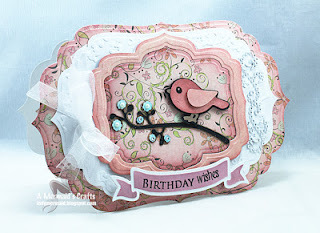 I used the Spellbinders Label Four for the base of the card and the base layer. The paper is from Basic Gray-Eskimo Kisses. 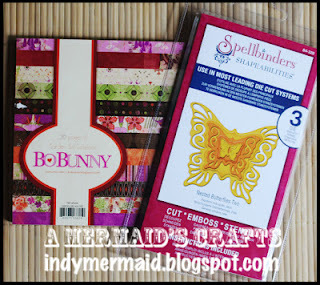 The white layer was embossed with a sizzix folder that was in the sizzix Birthday set #4. The frame is from the Spellbinders Label Nine die and popped up with foam tape for dimension and inked with Old Paper distress ink. The branch was cut at 1" and the bird at 1 1/4 plus the layers from the Straight from the Nest cartridge . 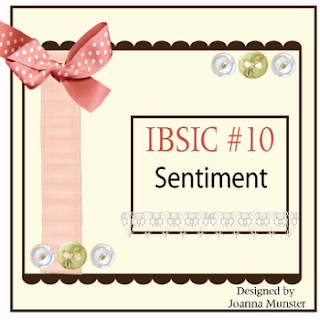 The birthday banner is from the Spellbinders ribbon & banners die and the sentiment is from My Creative Time ~Gift card sentiment set. I added a fun double satin bow and some pearls and rhinestone flourishes to finish the card up. 1.) Bitten by the Bug 2 ~Garden Challenge-anything you would find in a garden. My card base is 5 1/2 by 5 1/2 and the base layer is 5 1/4 x 5 1/4. I also cut a printed mat at 5 x 3 1/2 and added a border to the top and bottom of mat using a Spellbinders die called Moroccan Accents. The center mat is also a Spellbinders die-Fleur De Lis rectangles which I stamped a sentiment from the Tim Holtz-Urban Chic set. I added rhinestone flourishes and a few little buttons for accents. I finished the card by adding a double bow with crinkle ribbon that I won from my blogger friend, Karen at Little Scrap Pieces and a small beautiful flower that was cut from the Flower Shoppe cartridge at 2". My card base is 5 3/4 x 5 3/4 and the base layer at 5 1/2 x 5 1/2. I then added a few more fun layers using a fun Quic-Kutz die called Nesting Eyelet Circles. I cut one layer in red and the other in white which I embossed with the love set folder by Sizzix. I cut Mickey and Pluto from the Mickey and Friends cartridge at 4 3/4 plus all the layers. I added a cute sentiment from My Creative Time ~Many Greetings set along with a prima flower, some twine and a double satin bow to finish it up. 4.) DL.ART ~Thankful Thursday-Anything Goes! Happy Wednesday all! It's another rainy day here :( We really need the rain but I would love to get outside and finish cleaning up my perennial gardens. Oh well, I guess there is always a lot to do inside too! I have the day off so I am really trying to make the best of it. Here is a baby card that I made to add to my collection of baby cards since I am really low on them right now. The card base is cut from the Lacy Labels cartridge at 4.50 x 5.87 using my gypsy to weld the shapes together. The base layer at 4.03 x 5.25. The papers are from We R Memories-Cotton Tails-paper pack. The baby buggy is cut form the Baby Steps cartridge at 3 3/4 plus the layers. I used the PK Cherub Face set for the adorable baby face and added some fun rosy cheeks. 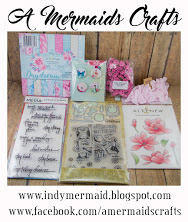 The congratulations is from My Creative Time ~Gift card sentiments set. I added a fun double bow, hemp and a cute little tag from My Craft Spot ~Tiny Tags set. I just love this tag set-definitely a must have! 1.) 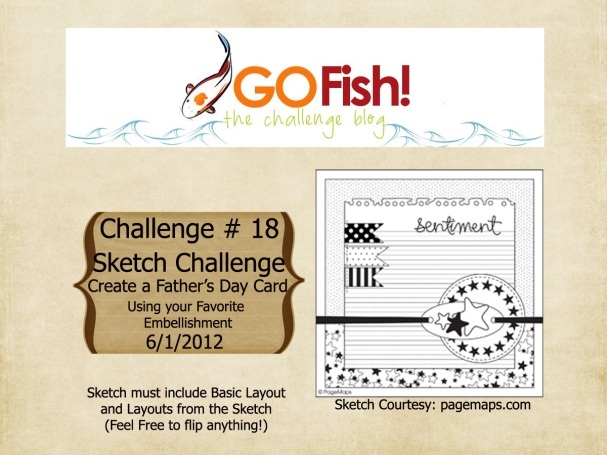 Peachy Keen Stamps ~Challenge #18-Anything Goes! Hello Everyone!! I hope you all had a great weekend and a wonderful Mother's Day!!!! I had such a wonderful time catching up with my high school buddies over the weekend. We had a blast just catching up, going out to eat, manicures, pedicures and of course shopping........I especially enjoyed that, lol! We spent one day at the huge Mall of America which was so fun but boy, are my feet killing me! I will no next time to bring my tennis shoes, lol! My card base is 5 x 5. I cut the pretty frame using my Spellbinders Fleur De Lis Rectangles die. The papers are from My Mind's Eye-Lost & Found. I then cut a layer that I cut from the paper pack with the design already printed on the paper. I distressed around the edges with Tim Holtz- walnut stain and pop dotted it on the frame for dimension. I added a fun sentiment that is from My Creative Time ~Floral sentiments. The flowers are cut at 1 3/4 and 2" from the Art Philosophy cartridge and the leaves are from Spellbinders Foliage die set. I added a double satin bow, a small piece of beaded garland and some pearls that I had in my stash to finish the card. 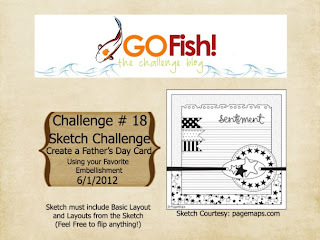 Be sure to pop over to Go Fish Challenge Blog and check out what the amazing Design Team has created for you for inspiration. 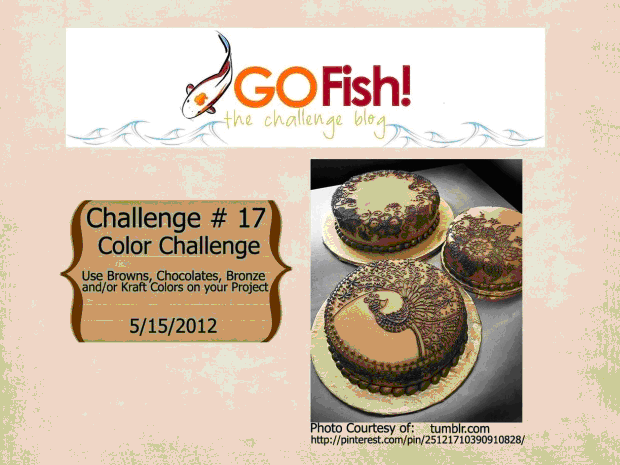 Hope you join us in this fun challenge!!! Wow, what a beautiful day!! The sun is shiny, birds just a signing and I have some time to craft:) yeah, life doesn't get much better, lol! Today, I have a quick card that I made for a wonderful friend of mine for always being so thoughtful! This is a standard 4 1/4 x 5 1/2 base card and the base layer is cut at 4 x 5. I cut a 2 3/4 x 3 1/2 and 3 x 3 3/4 mat to layer this cute little froggie on it. I cut the frog at 2 3/4 from the Paisley cartridge. I added a cute sparkly crown and some googly eyes for a fun look. Happy Monday!! Boy, did the weekend ever fly by! 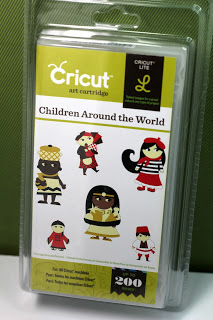 Hope you had a good one:) Today is another Challenge Me Monday over at Fantabulous Cricut Challenge Blog. The challenge this week is: Mother's Day! Make a project for your Mother, Grandmother, Sister, Aunt or another special lady in your life using her favorite color. is from My Craft Spot -Tiny Tags set. I added a fun leaf along the bottom which was a Martha Stewart leaf punch that I used. I added some fun crinkle ribbon from 3 Girl JAM and a little tag plus sentiment is from My Craft Spot-Tiny Tags set. I also added in some twine and a cute little stick pin. 1.) Really Reasonable Ribbon Challenge #47-Mother's Day and use ribbon.